... and the Sharpest Optical Image (0.18 arcsec) from the VLT so far...! Astronomers are eager to better understand the formation of stars and planets - with an eye on the complex processes that lead to the emergence of our own solar system some 4600 million years ago. Brown Dwarfs (BDs) play a special role in this context. Within the cosmic zoo, they represent a class of "intermediate" objects. While they are smaller than normal stars, they shine by their own energy for a limited time, in contrast to planets. Recent observations with the ESO Very Large Telescope (VLT) of a "young" Brown Dwarf in a multiple stellar system are taking on a particular importance in this connection. An evaluation of the new data by an international team of astronomers  shows that it is by far the youngest of only four such objects found in a stellar system so far. The results are now providing new insights into the stellar formation process. This small object is known as TWA-5 B and with a mass of only 15 - 40 times that of Jupiter, it is near the borderline between planets and Brown Dwarfs, cf. the explanatory Appendix to this Press Release. However, visible and infrared VLT spectra unambiguously classify it in the latter category. 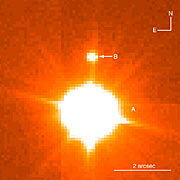 Accurate positional measurements with the Hubble Space Telescope (HST) and the VLT hint that it is orbiting the central, much heavier and brighter star in this system, TWA-5 A (itself a close double star of which each component presumably has a mass of 0.75 solar masses), with a period that may be as long as 900 years. And, by the way, an (I-band) image of the TWA-5 system is the sharpest delivered by the VLT so far, with an image size of only 0.18 arcsec ! In current astronomical terminology, Brown Dwarfs (BDs) are objects whose masses are below those of normal stars - the borderline is believed to be about 8% of the mass of our Sun - but larger than those of planets, cf. . Unlike normal stars, Brown Dwarfs are unable to sustain stable nuclear fusion of hydrogen. Once they have been formed, they enter into a very long phase of slow contraction. This process releases (potential) energy that is emitted in the form of electromagnetic radiation. Their brightness decreases with time, as they become smaller and smaller and their energy reservoir dwindles. A few dozen "free-floating", isolated Brown Dwarfs have been discovered so far in space. They include members of the well-known, comparatively young Pleiades cluster (120 million years old) and some much older ones (some thousands of million years) only a few light-years away. A typical example is Kelu-1 that was found at ESO in 1997, see ESO Press Release eso9709. However, despite extensive searches and much invested effort, astronomers have so far only found three Brown Dwarfs that have been confirmed as companions to normal stars: Gl 229 B, G196-3 B, and Gl 570 D.
The younger a Brown Dwarf is, the more luminous it is, and the nearer it is to us, the brighter it appears in the sky. Old Brown Dwarfs are intrinsically so faint that, with the currently available instruments, they can only be found if they are nearby. It is therefore no surprise that the known, nearby Brown Dwarfs are generally older than the more distant ones, e.g. those found in the Pleiades. It is on this background, that the international astronomer team  is now searching for young Brown Dwarfs that are companions to young, nearby stars. However, young stars are quite rare in the solar neighbourhood. Only a few were known before the very successful ROSAT X-ray survey that discovered about 100 young and nearby stars, less than 100 million years old and within ~ 300 light-years distance. The new research programme attempts to find brown dwarf companions to these and other young and nearby stars. For this, state-of-the-art infrared imaging cameras are used at the 3.6-m New Technology Telescope (NTT) with the SOFI (and SHARP) instrument on La Silla, as well as the 8.2-m VLT/ANTU telescope with the ISAAC multi-mode instrument at Paranal. The first step is to take high-resolution images of the stars from the ROSAT list to look for possible faint companions. However, any faint object found near one of the programme stars may of course be a completely unrelated fore- or background object and it is therefore imperative to check this by means of supplementary observations. Two methods are available. The first implies taking spectra of the companion candidates that demonstrate whether they are bona-fide Brown Dwarfs that display spectral lines typical for the cool atmospheres of this class, e.g., of Titanium Oxide (TiO) and Vanadium Oxide (VO). Infrared spectra are particularly useful for a measurement of the atmospheric temperature. The other involves obtaining a second image some years later. If the companion candidate and the brighter star belong to the same stellar system, they must move together on the sky or, as astronomers say, their measured "proper motions" must be (nearly) the same. If both checks are positive, the fainter object is most likely to be a bona-fide Brown Dwarf companion to the young and nearby star. To be absolutely certain, its orbital motion should also be detected, but it will be very slow and can only be perceived after several years of continued observations. Two years ago, a faint companion candidate was found near one of the young and nearby stars included in the present programme and designated TWA-5 (also known as CoD -33 7795). It is about 12 million years old and is a member of a group of about a dozen young stars (of the "T Tauri"-type), seen in the southern constellation Hydra (the Water-Snake) and grouped around the star TW Hya, the first to be found in this area ("TWA" means the "TW Hya Association"). The HIPPARCOS mission of the European Space Agency (ESA) measured a mean distance to some of these stars of ~ 180 light-years (55 parsec). This faint companion ("TWA-5 B") was first detected in 1998 with the Hubble Space Telescope (HST), but until now, no spectrum had been published, nor had the proper motion been measured. It is indeed a difficult object to observe: it is 100 times fainter than the bright star and is located only two arcsec away in the sky. In order to investigate the nature of this object, the team obtained images and spectra with the Very Large Telescope (VLT) at Paranal. An optical image was taken by ESO staff on 21 February 2000 during a technical test period () with the FORS-2 (FOcal Reducer/low dispersion Spectrograph) at the 8.2-m VLT/KUEYEN telescope. This is actually the sharpest optical image so far taken with the VLT, with a FWHM (full-width-at-half-maximum) of only 0.18 arcsec  and it shows the images of the primary star ("TWA-5 A") and the 100 times fainter companion ("TWA-5 B") very well separated. An infrared image was taken on 16 April 2000 with the ISAAC (Infrared Spectrograph and Array Camera) multi-mode instrument at the 8.2-m VLT/ANTU telescope. This image was obtained by ESO staff in service mode and again, TWA-5 A and B are both clearly seen. More recently, spectra of TWA-5 B were taken with FORS-2 (optical wavelength region) and ISAAC (infrared). These observations were particularly difficult, because of the need to avoid contamination from the strong light of the much brighter object, only 2 arcsec away. 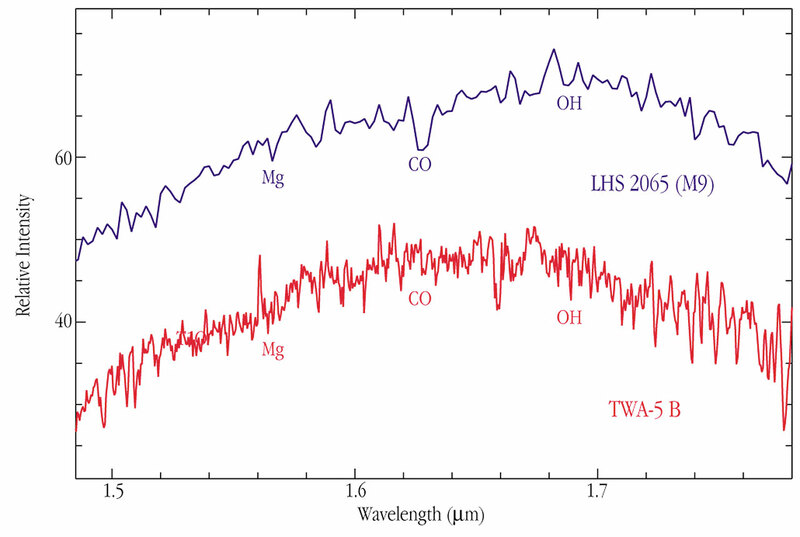 The optical spectrum of TWA-5 B shows strong molecular absorption features typical for very cold stellar atmospheres and confirming it as a Brown Dwarf. 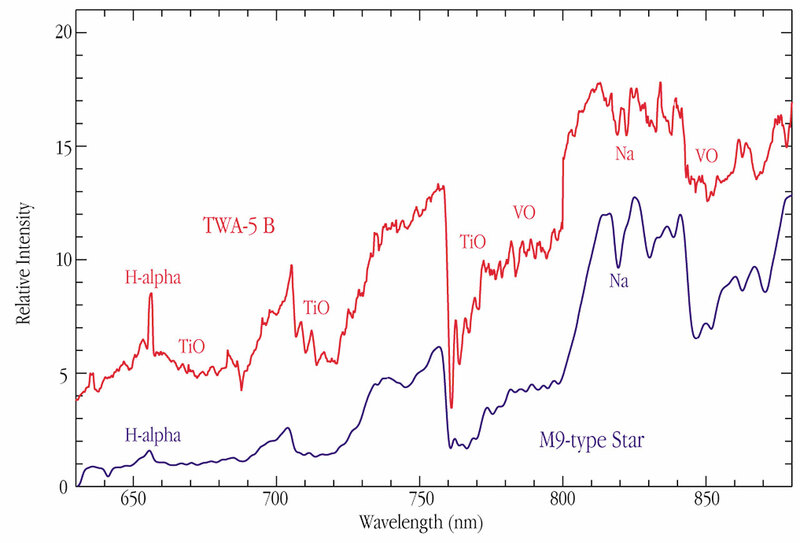 Both the optical and the infrared (ESO Press Photo eso0023) spectra indicate a late spectral type (about M9) of TWA-5 B that corresponds to an atmospheric temperature of "only" ~2200 °C (2500 K). For comparison, that of the Sun is ~ 6000 °C. The hydrogen (H-alpha) emission line indicates strong activity in the upper atmospheric layers (the chromosphere), as normally found in young stars and young Brown Dwarfs. Moreover, the comparatively weak sodium (Na) absorption line shows that this object must be relatively large for its low mass, and that it is still in the early stage of contraction. These are clear signs of young age and fully consistent with TWA-5 B being a bona-fide companion to the young star TWA-5 A . In fact, the possibility that an object as cold as TWA-5 B is located within 2 arcsec from TWA-5 A by chance is less than 10 -8. 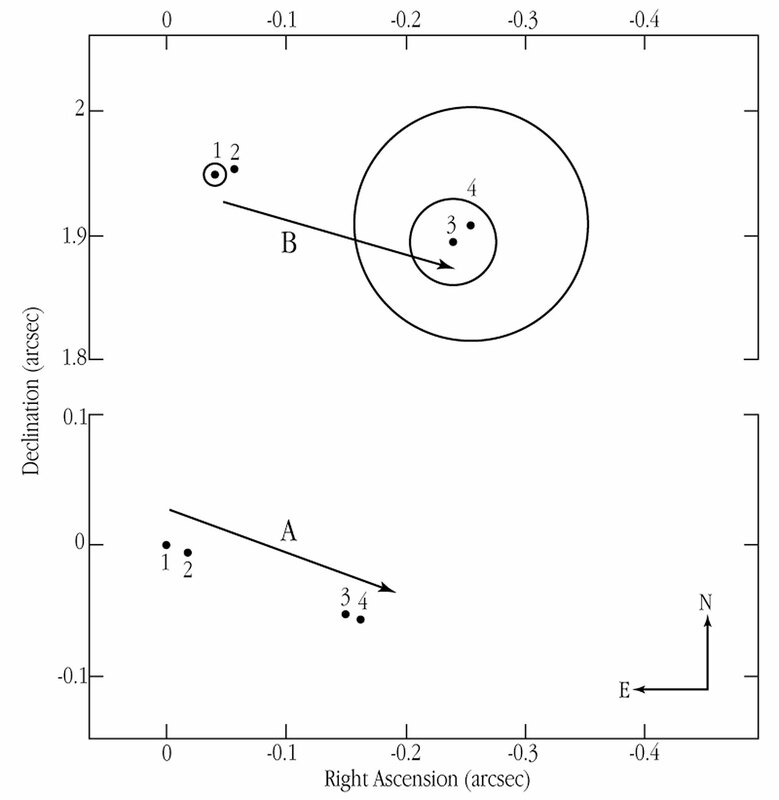 When comparing the HST positional observations from 1998 and those with the VLT in 2000 (ESO Press Photo eso0023), it is obvious that TWA-5 A and TWA-5 B move with very nearly the same speed and in the same direction on the sky. There is therefore no doubt that the two objects are physically connected within a stellar multiple system. At the distance of about 180 light-years, the angular separation (2 arcsec) corresponds to a projected distance of 110 AU (about 2.75 times the mean distance between the Sun and the outermost planet in the solar system, Pluto). From this and the mass of TWA-5 A, it is possible to conclude that one full orbit of TWA-5 B around TWA-5 A will last about 900 years. From the measured optical and infrared brightness of TWA-5 B and the known distance, it is found to be about 400 times fainter than our Sun. Together with the measured temperature, about 2200 °C, and based on theoretical models of Brown Dwarfs, a mass of about 15 to 40 Jupiter masses is deduced. It is also possible to estimate its age; it is found to be very similar as that of TWA-5 A (12 million years), further supporting the conclusion that they were formed at the same time and belong to the same stellar system. TWA-5 B is only the fourth Brown Dwarf so far confirmed as a companion to a normal star, both by spectroscopic and proper motion measurements. It is unique among these by being by far the youngest (12 million years). The others are much older; one is nearly 300 million years old and the other two are several thousand million years old. Indeed, TWA-5 A and its Brown Dwarf companion TWA-5 B are still in the process of formation . The system is the only one so far discovered at this early evolutionary stage. These new findings thus have a direct bearing on the question how Brown Dwarfs form as companions to normal stars. More detailed investigations of this unique object are now planned. They will include an attempt to detect absorption lines of other elements that are typical for brown dwarfs (especially of lithium) by means of higher-resolution spectra, as well as further imaging that may lead to a detection of the orbital motion within a few years. The team is also actively searching for other very low-mass companions in order to cast more light on some of the fundamental questions, e.g. : What is the mass range of Brown Dwarfs? What are their orbital characteristics? Can stars of all masses have Brown Dwarf companions? Are the distributions of the masses of isolated and companion brown dwarfs similar or different? Not less exciting, the same observational method can also be used to search for companions of even lower mass, in particular planets. Until now, no extra-solar planets have been detected directly, but only indirectly by other methods, c.f. ESO Press Release eso0019. For this, "deep" images of young nearby stars and their immediate surroundings must be obtained. Young planets are also still relatively hot and, hence, relatively bright, but they are many times fainter than TWA-5 B, hence the need for long exposures. However, such observations are extremely difficult, as any planet - even a young and relatively massive and bright one - will be much fainter than the star around which it revolves and is located very close to it in the sky. One observational method that helps overcome this fundamental obstacle is already used by the team. It consists of taking a very large number (hundreds or even thousands) of very short exposures (1 second or less) and then to add them up using computers (the "speckle method") and suppressing the image blur caused by atmospheric turbulence. In this way, even very faint companions may be detected near bright stars. This will work even better with adaptive optics, e.g. with the CONICA-NAOS instrument that will soon be installed at the third VLT Unit Telescope, MELIPAL. When will the first image of an exoplanet be obtained? This kind of research is very exciting, but also demands great care. A recent event illustrates this. Just a few months ago, the present astronomer team detected a companion candidate to another young star on their list (TWA-7). This object was 100,000 times fainter than and only 2.5 arcsec away from TWA-7. If it were a true companion orbiting TWA-7, its mass would have been only 3 Jupiter masses (as deduced from the observed brightness) and it would thus very likely have been a true exoplanet. 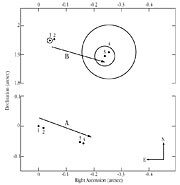 However, an infrared spectrum subsequently taken with the ISAAC instrument at VLT/ANTU showed that it was in fact a background star, located almost 10,000 light-years farther away than TWA-7! Despite the negative result, those observations clearly showed that direct detection and subsequent, effective spectroscopic verification of extra-solar planets is now quite feasible with a ground-based facility like the VLT. It is thus not a very daring prediction that the ongoing searches may soon lead to the first direct images of an extra-solar planet. These are indeed exciting times! The team consists of Ralph Neuhaeuser (Principal Investigator) and Nuria Huelamo (both Max-Planck-Institut für Extraterrestrische Physik, Garching, Germany), Eike Guenther (Landessternwarte Tautenburg, Germany), Monika Petr (Max-Planck-Institut für Radioastronomie, Bonn, Germany), Wolfgang Brandner (Institute for Astronomy, Honolulu, Hawaii, USA) and João Alves (ESO, Garching, Germany). The hitherto sharpest image (0.25 arcsec) was obtained in March 1999, c.f. ESO PR 06/99. It was obtained during a period of exceptionally good "seeing" (low level of atmospheric turbulence). The installation of adaptive optics at the VLT, foreseen in 2001, will provide a means to overcome the image smearing effect of air turbulence and hence, consistently obtain stellar images of a few hundredths of an arcsecond diameter, near the theoretical limit for an 8.2-m telescope (the telescope diffraction limit ). 1 solar mass = 2 x 10^30 kg. 1 Jupiter mass = 2 x 10^27 kg ~ 0.001 solar mass. Thus, the "BD-limit" of 0.08 solar masses corresponds to ~ 80 Jupiter masses. This CCD frame was taken by Paranal Observatory staff during the one of the KUEYEN/FORS-2 "dry runs" in a "technical period", i.e. test observations that served to practise and perfect the operation of the telescope and instrument, before it was made available to the community on April 1, 2000. These and many similar data from this period were quickly released to the community and are available in the publicly accessible area of the VLT Data Archive. The work described in this Press Release is discussed by the team in a research article that has been accepted for publication in the European journal Astronomy & Astrophysics. Another paper ("Direct imaging search for planetary companions next to young nearby stars") is also available with more details about the current searches, including the spectrum of the background star at TWA-7. Planets and Brown Dwarfs mainly differ by the way they form. While it is believed that Brown Dwarfs (both as companions to normal stars and as isolated objects) form as do normal low-mass stars by fragmentation and subsequent contraction in interstellar gas clouds, planets form in circumstellar gas- and dust disks around their central star. However, an exact dividing line in terms of mass cannot yet be drawn between planets and brown dwarfs, neither from theory nor from observation. It appears that the lower mass limit for Brown Dwarfs is around 0.01 solar masses (about 10 Jupiter masses) and that the upper mass limit for planets is also near this value. Further observations and theoretical progress are needed to clarify this question. Below this mass limit (~ 0.01 solar masses), an object cannot burn the hydrogen isotope deuterium. Planets will therefore have more deuterium in their atmospheres than Brown Dwarfs. One way to distinguish observationally between a planet and a Brown Dwarf is therefore to search for absorption lines of deuterium in the spectrum of the object. These lines would be much stronger in a planet than in a Brown Dwarf. However, such observations would require very high spectral resolution in the infrared region. At this moment, no corresponding observational facilities exist, but it will most probably be possible with the VLT High-Resolution IR Echelle Spectrometer (CRIRES), currently under development for installation at VLT/ANTU in 2003. The dividing line between real stars on one side and Brown Dwarfs and planets on the other side is better known. Any object that weighs less than ~ 0.08 solar masses cannot sustain stable fusion of hydrogen and also cannot burn the light element lithium.